Offering you a complete choice of products which include embroiderd straight cut suit, green readymade suit, off- white readymade suit, straight cut readymade suit, cotton readymade suit and embroiders readymade suit. 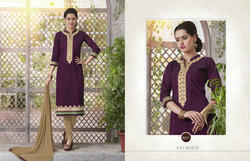 Pair this outfit with accessories and complete your ethnic look. Note:Slight variation in actual color vs.image is possible. 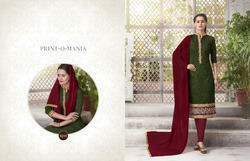 Top Length:46 Inches,Top:2.50 mtr,Bottom:3 Mtr.,Dupatta:2.30 Mtr. 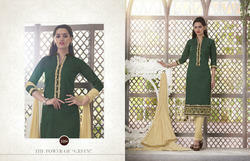 The outfit comes along with cotton bottom and chiffon dupatta. Note: Slight variation in actual color vs. image is possible.Top Length:46 Inches,Top:2.50 mtr,Bottom:3 Mtr.,Dupatta:2.30 Mtr. 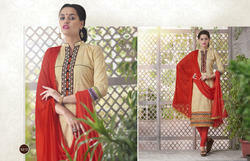 The suit comes along with cotton bottom and chiffon dupatta. Our organization has gained immense appreciation from our clients for offering premium quality collection of Embroiderd Readymade Suit. The offered suit is precisely designed using premium quality fabric that is procured form most reliable vendors of the market. Our skilled designers designed this suit in compliance to set industrial norms. We are offering this entire range in multiple color options, at market leading prices.